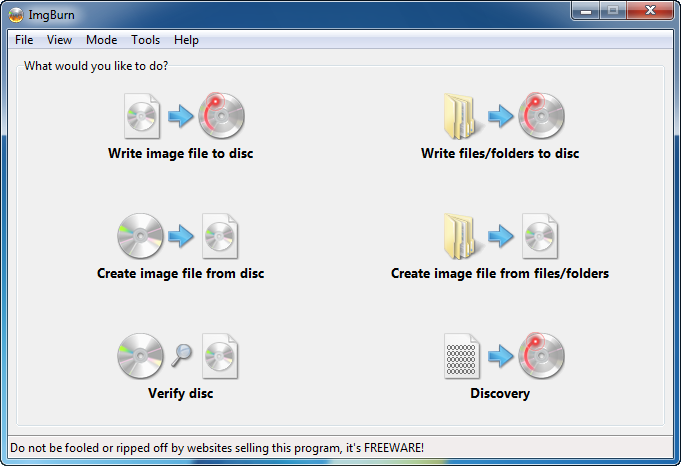 ImgBurn is a free tool that enables you to burn CD/DVD images with ease. All the latest drives are supported (including booktype / bitsetting on many of the major ones). Advanced functionality can be found in the ImgBurn context menus. CLEAN INSTALL! No OpenCandy bundled. great, just take care of avoiding the toolbars and crap during installation. This app is awesome ... then they added junk-ware to it in v2.5.8.0 ... I got my older version back at oldapps.com ... hope this helps. Be warned that 2.5.8.0 has a whole bunch of crapware that gets installed with it. Otherwise a great program until this release. it was the upper and lower filets that needed be deleted, system reboot and the burners were working. That's why this is such a good burner program, it also helps to find bios updates and change region + more options are available to the user. Interface looks a little dull, never the less its as solid as a rock. I had the unfortenate Error of Lead Out not completing in Nero, Roxio, Windows, BurnerXP & so on & so forth 25X!!! Murfy's LAW: ImgBurn was the last App I tried & have been smiling ever since!!! Also, I find it so convenient that I can install it so easily and burn CD/DVDs in a matter of seconds! Just use 7-zip to unpack it. All you need to make it work is actually just the main exe file and nothing else. Still a good piece of software,except for the added ASK TOOLBAR! 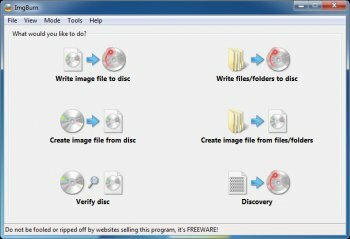 An easy way to bypass the ASK.com data miner from going anywhere !Just download 7zip and when it's installed (7zip) just right click the setupimg exe and choose 7-zip ,then choose extract to "setupimgburn"
Now this will extract the contents of the imgburn exe to a folder,now you can open that folder and start imiage burn just by clicking the imgburn exe.The programme will start straight up into image burn without you being bugged for installing the ASK toolbar data miner ,as this method bypasses all the guff . You could also go into the same folder and into the $PLUGINSDIR folder and delete both the apnstub exe and the apntoolbarinstaller exe just to further prevent any trickery. I've used this little app since the DVD Decryptor days. It's is, by far, the best burning package available today and it just gets better with each update. Easy to use for the absolute beginner and advanced enough to tackle almost any "burning" task. I can't rate this highly enough. For use it in a iMac? Perfect burning app though "ApnStub" (toolbar) launches before the ImgBurn install so 3 points less.